Another week, another top-five showdown awaiting us. Seven days after Duke beat Virginia for the second time this season, Tennessee will travel to Lexington to face Kentucky in a pivotal SEC clash. But who will emerge with a marquee victory? We tackle that in this week’s roundtable, plus we look at which teams are at risk of fading late in the regular season and name which players we’re most excited to see enter the spotlight in March. Who are you taking in Tennessee and Kentucky’s top five clash? Dan Greene: Kentucky. The Wildcats have emerged as Tennessee’s best challenger and while I wouldn’t pick against the Vols to take the SEC, I think homecourt advantage will be a factor in both of these teams’ matchups this season. Kentucky’s defense has been phenomenal in league play, enough so that it will be tough even for Tennessee to handle. Jeremy Woo: Give me the Vols. Tennessee is the toughest team in the country and won’t be fazed on the road. Kentucky has raised its play a good deal, but it’ll be hard-pressed to create offense in this one. Tyler Herro would be my X-factor—if his jumper is falling, the ‘Cats should be in it until the end. I don’t really think anything can faze Tennessee at this point, and while this would be a big statement for UK, I’m still not all the way there with them. Eric Single: Kentucky. Although Tennessee proved it can launch threes to separate from elite teams when it knocked off Gonzaga, the Volunteers would prefer to play inside the arc, which is where Kentucky has improved the most since the beginning of the season. Tennessee won’t enjoy the long-ball success in Rupp Arena that the likes of VMI star Bubba Parham did in the season’s opening months, and PJ Washington and the Wildcats’ other frontcourt mainstays will feed off the crowd to out-tough the Vols’ bigs, which is no easy task. Michael Shapiro: Kentucky has been on a roll with 10 straight victories prior to Tuesday night’s matchup vs. LSU, but Tennessee will bring the toughest task yet for the Wildcats’ youngsters. Rick Barnes’s squad is perfect since December, rolling undefeated through SEC play. The dynamic frontcourt of Grant Williams and Admiral Schofield should limit Kentucky inside. John Calipari and Co. don’t want to get in a battle from beyond the arc, with the Wildcats ranking No. 319 in the nation in made threes despite largely solid percentages. Expect Saturday’s battle at Rupp Arena to come down to the final minutes. It will be Tennessee’s hardest test of the season, yet my money is on the Volunteers to escape with a victory and continue their undefeated record in the SEC. Emily Caron: I’m tempted to go with the Vols here because I truly don’t think there’s a more consistent or cohesive team in the country, but the reality is that a road win at Rupp against a talented Kentucky team will be a really tough win to take. The Wildcats have a bit more balance on both sides of the ball than Tennessee has shown this season, and they’ve looked better and better each game. I’m rolling with the home team in this one, but round two in Knoxville will be a different story. Max Meyer: Tennessee hasn’t faced a team ranked inside kenpom.com’s top 35 in two months. Seriously: The Volunteers’ last matchup against a strong team was their 76–73 win over Gonzaga on Dec. 9. Over that span, Kentucky has beaten North Carolina, Louisville, Auburn, Kansas and Mississippi State. The Wildcats are one of the hottest teams in the country, and they have the personnel to play with Tennessee’s physical style of play. This is also the toughest environment thus for for a Tennessee team that has played just six true road games up to this point. Give me the ‘Cats to make a statement win at Rupp. Molly Geary: This one will in all likelihood go down to the wire, but I’ll stick with Tennessee, even at Rupp Arena. This is a game where the Vols’ experience could win out, as one of the more veteran teams in the country. Not only does Tennessee have the lowest turnover rate in the SEC, but its No. 27 ranking in that area makes it the only SEC team within the top 100 nationally (Florida is next at 120th), which may temper some of the Ashton Hagans effect. Both teams prefer to do their work inside rather than on the perimeter, but the Wildcats, who rank fourth in offensive rebound rate, could take advantage of second-chance points. Bracket Watch: Does Duke Already Have No. 1 Overall Seed Secured? With one month left in the regular season, which team is at most risk of a late-season fade? Greene: Louisville is going to be playing the rest of the regular season uphill, with Duke tonight and a home-and-home with Virginia, plus a trip to Syracuse that will be no picnic. As impressive as the Cards have been this season, it may end with a few bumps. Woo: I’m at least minorly worried about Kansas. They Jayhawks have already been a little up and down, and the rest of the way won’t be a cakewalk, with three tough road environments on tap (Texas Tech, Oklahoma State and Oklahoma) plus K-State at home. They’re a little too reliant on Dedric Lawson, and while I‘ve been extremely impressed with Ochai Agbaji’s immediate contributions, KU still needs a guard not named Devon Dotson to step up on a nightly basis. There are too many freshmen in this backcourt for my liking right now, and that plus the fact that Lagerald Vick is away from the team does not scream stability. Color me concerned. Shapiro: Virginia Tech senior point guard Justin Robinson injured his ankle in a win over Miami on Jan. 30, and the Hokies haven’t been the same since. They have lost two of their last three matchups, and scored just 47 points against NC State on Feb. 2. The slate won’t get much easier in coming weeks, with home matchups against Virginia and Duke on the calendar along with a road battle at Florida State. Virginia Tech has slipped from near the top of the ACC to sixth entering Tuesday night. The Hokies could fall to .500 as conference play ends, and force what was previously a potential top-four seed to a team on the bubble. Caron: Clemson. I was excited about the Tigers this season given their experience and the backcourt duo of Macquise Reed and Shelton Mitchell. Clemson had four returners from their Sweet 16 team, but to say they’ve been underwhelming is an understatement. They had a tough start to ACC play but bounced back pretty well. Even after an impressive win over Virginia Tech, I still say the Tigers are in for some late-season trouble. They’ve had trouble getting things to click in big games and with Louisville, Florida State and North Carolina all on deck in the next month I think a few consecutive losses could send the Tigers spiraling. Meyer: Virginia Tech’s offense hasn’t been the same since Justin Robinson’s injury (under 0.90 PPP in two of the past three games), and the Hokies might not get their star point guard back for a while. This is already a team that doesn’t have great depth, so really losing any starter is suboptimal in Blacksburg. They also have a tricky five-game stretch that includes road games at Pitt, Notre Dame and Florida State, along with hosting Duke and Virginia. Before Robinson got hurt, VT was 17–3 (6–2 vs. ACC foes), but it could end up sliding down the stretch and wind up as a No. 5 seed or worse in the NCAA tournament. Geary: They could just as easily make me look foolish here, but I’ll go with the Tar Heels. Dropping Monday night’s game at home to an excellent Virginia team isn’t a back-breaker, but it’s only the start of a difficult stretch to end the regular season. Of UNC’s seven remaining games, five are against top-50 teams, including two games with Duke, home games with Florida State and Syracuse and a road trip to Clemson that could potentially feature a Tigers team on the bubble and desperate for a marquee win. The Heels have been banged up lately, including seeing Nassir Little exit with an ankle injury on Monday, and that could play a factor during a time when the wear and tear of the season really takes its toll. We all know that Zion is appointment TV. Who’s another entertaining player you can’t wait for the country to see in March? Greene: Markus Howard. He’s got the kind of explosive, three-driven scoring prowess—three 40-plus-point games this season, plus four more in the 30s—that can make for instant March stardom and could help Marquette outperform its seed line, even as a No. 3 or 4. 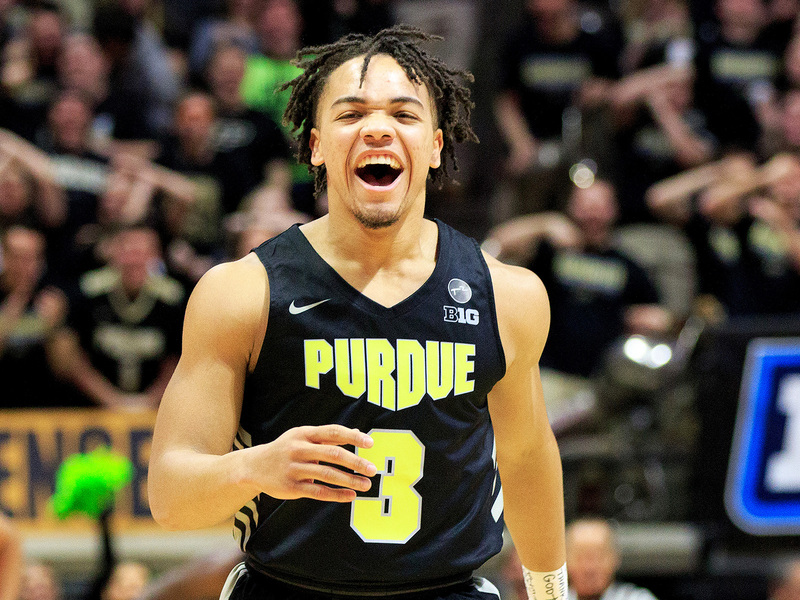 Woo: Carsen Edwards has deserved a much larger slice of the spotlight for the better part of two seasons now, and if you’re looking for a guard who could have a Kemba Walker-like March explosion, I’d start with him. As usual, Purdue will need him to do pretty much everything, and he’s been up to task more often than not. Watching Edwards dart around the floor and drain jumpers from anywhere never gets old. Single: I interpret this question as, “Who most deserves to get buckets in front of a national audience in March?” and the answer is St. John’s guard Shamorie Ponds. Are the Johnnies a perfect team? Nope. They’re part of the five-way tie for third in the Big East and are doomed to spend the next month on the bubble, having gone over a month without consecutive wins. But their leading scorer is a 6’1″ lefty from Brooklyn with boatloads of athleticism and no fear who had four 30-point outings in the first 15 games of 2018–19 and seems to seek out shots with the highest degree of difficulty possible. Let’s just hope St. John’s doesn’t draw into the same region as Duke, which reduced Ponds to rubble in Durham a few weeks ago, thanks to Tre Jones’s lockdown defense. That doesn’t deserve to be Ponds’s most widely viewed performance of the year. Shapiro: I’m skeptical that Marquette has the talent to reach its first Final Four since the Dwyane Wade era, but it will be damn fun to see Markus Howard try. The sub-6’0” junior is perhaps college basketball’s most electric scorer, and he’s wholly unafraid to let if fly from beyond the arc. Howard’s 38-point eruption to beat Villanova on Feb. 9 provided a preview for March, with Howard racking up 24 shot attempts before the final buzzer. The Golden Eagles aren’t immune to an early-round upset, and they’ve been a middling program for much of the Steve Wojciechowski era. Regardless, expect Howard to empty the chamber in March, with Marquette’s tournament dreams riding on his jump shot. Caron: Since we were talking about Tennessee… I’m excited to watch Grant Williams and Admiral Schofield go to work this March. I can’t decide which I’m looking forward to watching more—both are National Player of the Year contenders on a team that’s poised for a deep run. Williams, the reigning SEC player of the year, leads the team with 20 points per game and an explosiveness that’s so fun to watch. Then there’s Schofield, who knows how to hit a big shot when the team needs it (like his absolute dagger from deep against Gonzaga), which is what March Madness is all about. Meyer: There are several players worthy of this spot here thanks to their contributions on the offensive end. I’m going to go in a different direction, though. Matisse Thybulle is the heart and soul of Washington’s 2–3 zone, and he is my pick to win Pac-12 Player of the Year. The 6’5” senior guard is averaging 3.3 steals and 2.2 blocks per game (he’s first nationally in steal percentage and 63rd in block percentage). Like his name suggests, Matisse is an artist on the defensive end. It’s rare to see a player dominate a game without scoring much, and Thybulle is one who certainly can, even though he does average 9.7 ppg. He’s such a unique talent and can carry Washington in March to an NCAA tournament win or two. Geary: Admitted homer pick, but as a Maryland grad I watch every Terps game, and I can attest that Bruno Fernando is an absolute joy to watch. The big man’s energy is infectious and he plays with a ton of emotion, and he can equally feed off supporting or jeering crowds. Fernando’s thunderous dunks are often a must-see (he can make the highlight reel on the other end, as well) but his game is far more than just flashiness, and it’s easy to picture the sophomore stealing the show during his first—and likely only—experience of March Madness.